This entry was posted on 9th December 2018 by Ian Gott. The HSE has issued a Safety Alert in relation to arm locking mechanisms on BendPak 2 post lifts. An investigation into the death of a motor vehicle mechanic, following a car falling from a two-post vehicle lift, has identified a serious risk. Investigations found that the arm locking mechanism of the BendPak 2 post lift did not prevent the vehicle from falling. This safety alert is aimed at users of BendPak 2 post vehicle lifts to prevent the situation being repeated, and causing further serious injury or death. Anyone using the BendPak 2 post lift should act now. 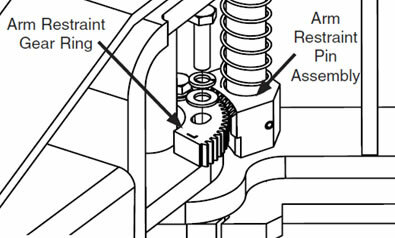 Users should check the arm restraint gear on their lift and, if affected, take immediate action to replace parts as detailed below. An unknown number of BendPak 2 post vehicle lifts have been supplied with arm restraint gears which allow complete disengagement from the arm locking mechanism, located on the carriage of the vehicle lift. Also, in some of the lifts, the arm restraint gears are manufactured from a material that is insufficient to withstand the forces which satisfies the testing required by the harmonised standards relating to vehicle lifts. The current standard is BS EN 1493:2010. The manufacturer has now redesigned the arm restraint gear. The new design is a machined part using a grade of steel which was found to be suitable when tested by the manufacturer. The gears now have circular rather than oval holes and a wider cross section which prevents disengagement. Lifts which have not been supplied with this re-designed part still present a serious risk. an internal diameter much larger than the pin that the arm swings on. If checks show that there is lateral movement in the arms then the lift should not be used again until the necessary replacement parts are fitted. As a temporary measure, it may be possible to continue to use the lift prior to replacement if a competent person has confirmed that the gears are fully meshed and regular checks are being carried out. If the lift does not have the newly designed arm restraint gear take immediate action to replace it. Users should contact their supplier, or the manufacturer, to get replacement parts. The gears should be steel, machined with circular holes. They should sit properly against the pin that the arm swings on without visible clearance. BendPak have provided a video which demonstrates how this replacement can be carried out by a competent person link to external website. Users should make sure that the lift is thoroughly examined and tested after replacing the gear. This is required in law under the Lifting Operations and Lifting Equipment Regulations 1998 (LOLER). Anyone using two post vehicle lifts should inspect and maintain them in accordance with the manufacturer’s instructions. If you require any help in identifying if you have any lifts with these defective arm locking mechanisms then please do not hesitate to give us a call, or email service@gottservices.com. Click here to view the Safety Alert on the HSE website.